The majestic entrance to the Theatre Antique in the city of Arles in the Bouches du Rhone region of Provence in France, Europe. Visitors to Arles in Provence, France will be amazed at the beauty and history of the city. Arles dates back to the Greeks settling here around 600BC, but it was the Romans who erected most of the buildings, or ruins that one can see today.The Theatre Antique in Arles, Provence, was built in the 1st century BC by the Romans in the reign of Augustus. It was not a natural amphitheatre, so local stone was used to build the high back walls, as well as the magnificent entrance. This great theatre once boasted thirty-three tiers and seated 20,000 people.Today, when one passes through the entrance to the Theatre Antique in the city of Arles, Bouches du Rhone, in Provence, France all there is left are two almost complete columns, a few fragments of columns and a quiet parklike atmosphere.Entrance gate at the Theatre Antique in the city of Arles, Bouches du Rhone, Provence, France, Europe. 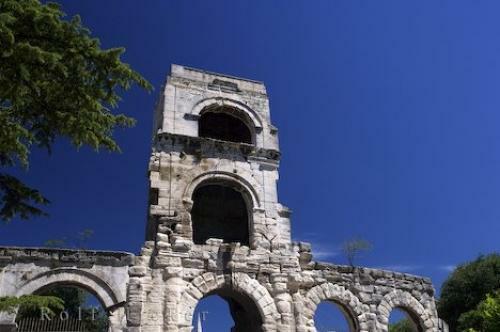 Photo of entrance gate to the Theatre Antique in the city of Arles, Bouches du Rhone in Provence, France in Europe.